The Tipografia Alimentare was immediately successful as soon as it opened (quite recently). It is near the Naviglio della Martesana, a canal to the north of Milan that is loved by locals but unknown by tourists as it is far from the usual tourist areas. It has simple but really high quality dishes (providers are carefully selected) and a really good quality/price ratio. 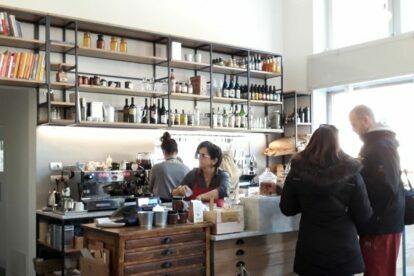 The location is quite unusual: it used to be a post office, and it still has a sort of rough, industrial look, with wooden tables, basic chairs and shelves on the wall, but this only adds a genuine touch to the place that really makes it different from the gentrified cafes of the city center. I’ve been to Tipografia Alimentare quite a few times by now, and it is always full of very different people: families with children, young couples, runners (the Naviglio della Martesana is ideal for this activity), bikers and locals of any age. I love the croissant and the cappuccino but if you go for the aperitivo I really suggest you get a tagliere di formaggi (cheese course) to try local products that you can’t find at the grocery store.